Do you find yourself walking through the seasonal aisles at your favorite dollar spot needing to buy everything you see? Well, I have a thing for mini erasers. I cannot walk past without purchasing them. The snowmen erasers that I found recently were no exception — they were too cute to pass by. 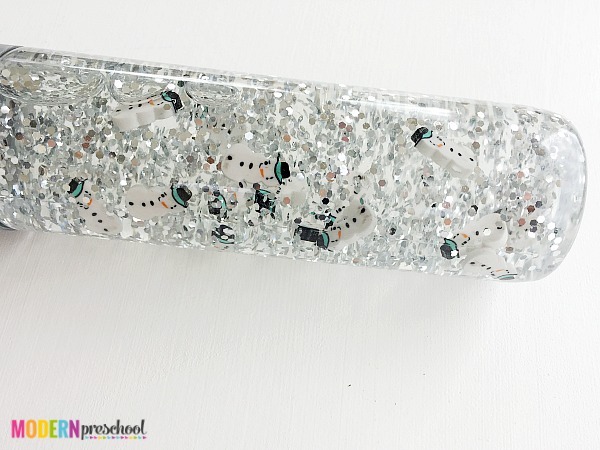 The erasers worked perfectly for our snowmen in a snowstorm sensory bottle too! My 6 year-old was a huge help with putting this snowstorm sensory bottle together. She could do it all, but I did help her with the corn syrup to avoid a sticky mess. 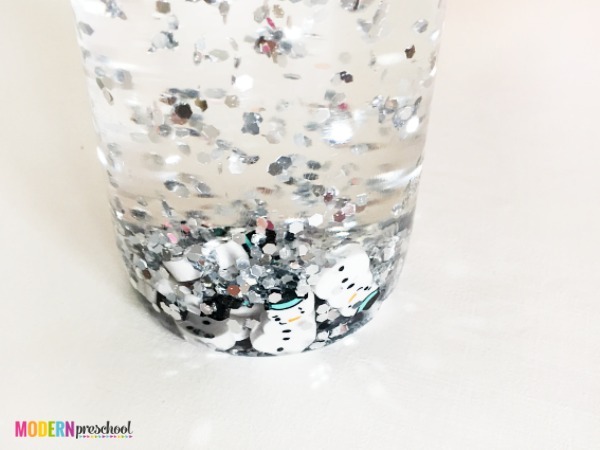 We poured a little over half of the water out of the bottle and added glitter and the snowmen erasers. I thought we should put 10 snowmen into the bottle so my preschoolers could work on counting to 10. My 6 year-old thought it was a better idea to add 20, so that my preschoolers could count past 10. We settled on 15! Then we used the light corn syrup to fill the bottle back up. 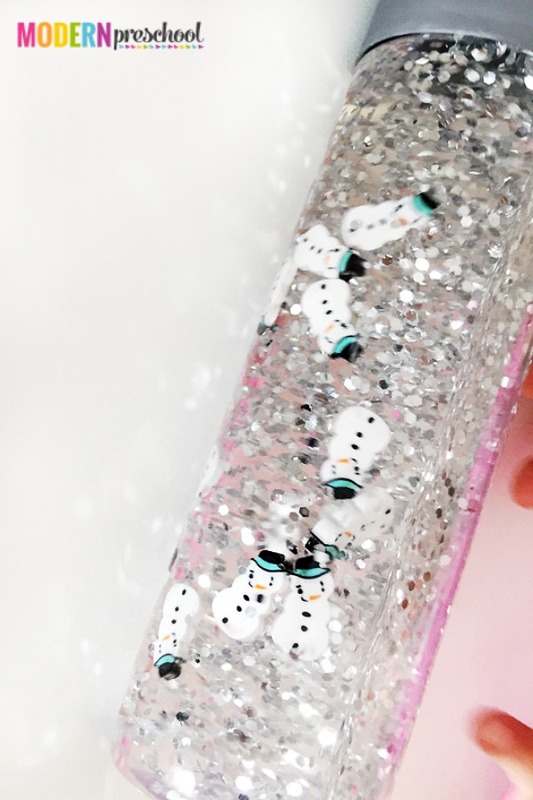 The corn syrup thickens the liquid inside the bottle and helps slow down the movement of the glitter and the snowmen erasers. It makes it seem more magical when the glitter completely surrounds the snowmen during the swirling snowstorm. Seal the top. You’re done! Now it’s time to give the bottle a swirl. As the glittery snowstorm intensifies, the snowmen are harder and harder to see. It’s hard to take your eyes off of the snowstorm! 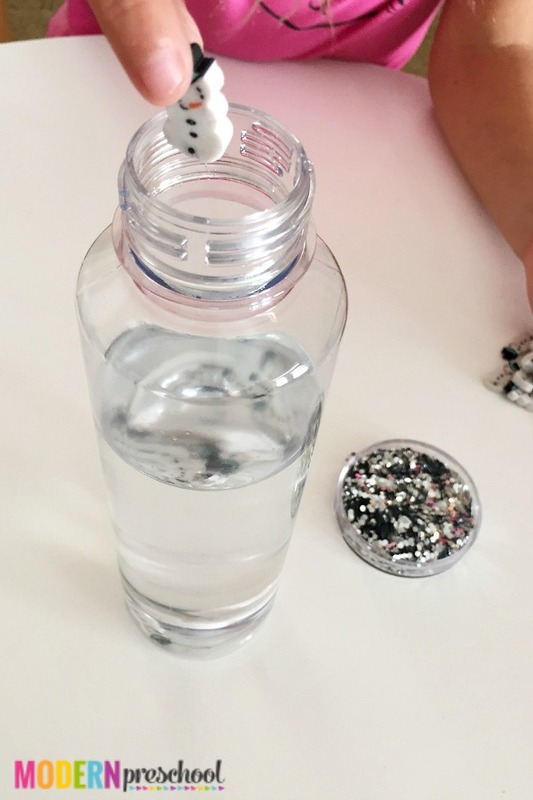 I use sensory bottles in my classroom all the time! My preschoolers love to share them at circle time while I’m reading a story or we’re singing. Then I have them available throughout the day. 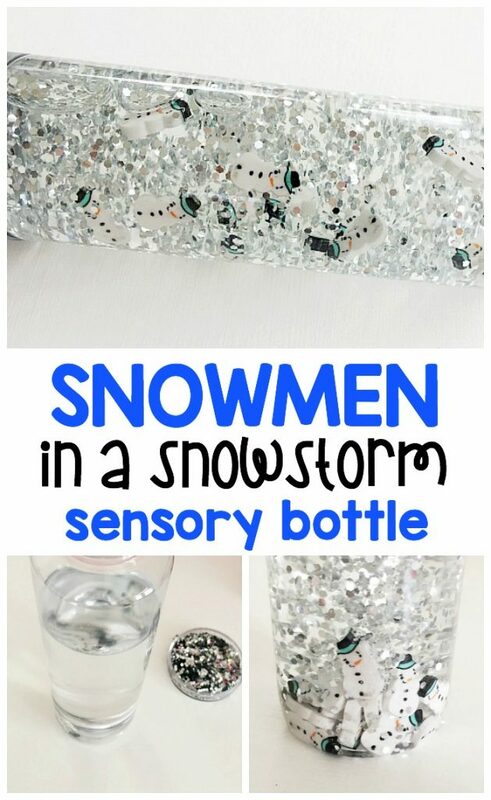 After you make your own snowmen in a snowstorm sensory bottle, check out some of our other favorites! Would baby oil work instead of corn syrup?